The Occupational Safety and Health Act, (OSHA), was created to ensure safe and healthy working conditions for individuals engaging in business affecting commerce. OSHA has two regulatory functions: setting standards and conducting inspections to ensure that employers are providing safe, healthy workplaces. Typical workplace safety and health responsibilities include recognizing and removing worksite dangers, taking in all actions possible to safeguard employees from illness or injury, and teaching employees about workplace health and safety procedures. There are five crucial areas of focus for small business: emergency plans, fire safety, hazardous materials, first aid, record-keeping, and OSHA posters. Generally, all small businesses with employees must comply with OSHA regulations regardless of the size of business. However, based on the industry and the size of the business, some small businesses may be partially exempt from complying with certain OSHA regulations. Because many arts organizations trust GLA for legal assistance, we want them well informed of OSHA regulations that may apply to them. 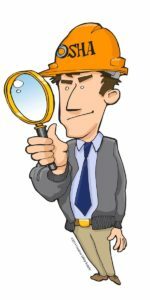 Who is an employer for purposes of OSHA? OSHA covers most private sector employers and their employees. Under OSHA, the term ‘employer’ means a person engaged in business affecting commerce and generally, covers any employer with one or more employees in such a business. The term ‘business’ is interpreted to include any profit making or non-profit making activity affecting commerce. Therefore, if an employer has a business with one or more employees, the employer has a duty to provide a workplace free from recognized hazards that are likely to cause death or serious physical harm regardless of business size. Under OSHA, the most important factor in determining an employer is who controls the manner in which the employees perform their assigned work. Businesses that meet three conditions are subject to OSHA: 1) They control the actions of their employees; 2) they exercise command and power over employees; 3) they have the authority to fire employees. Because OSHA’s objective is to improve workplace safety, the employer has the authority to control the employee’s manner of work and is likewise responsible for ensuring the safety of these employees by creating safe work practices and maintaining a safe work environment. 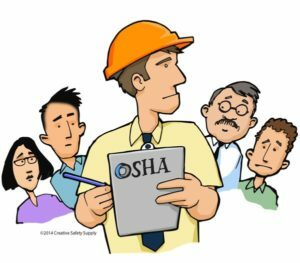 Who is not covered under OSHA? Generally, OSHA regulations do not apply to self-employed individuals such as sole proprietors. A self-employed individual will only be subject to OSHA requirements if they hire employees. Additionally, an uncompensated intern or volunteer is not considered to be an employee under OSHA. A person is an intern and not an employee if: 1) training is similar to a vocational school; 2) training is for the benefit of the intern; 3) the intern does not displace regular employees; 4) the intern isn’t entitled to a job at the end of the internship, and 5) intern is not paid for services. Lastly, OSHA does not cover working conditions for which federal or state agencies regulate worker safety unless they are in one of the states operating on OSHA-approved state plan. Yes, small businesses must develop an emergency action plan that features how employees can leave the workplace in the event of an emergency and what actions should take place in such a situation. Small businesses must also have a fire safety plan. A written fire safety plan details actions that employees must follow in the event of a fire. Emergency fire exits must be easily recognizable and always kept free of obstructions. OSHA also requires small businesses to give employees clear information concerning the use of hazardous chemicals. Employees must receive appropriate training in the use and handling of these chemicals and all such materials must be clearly identified. Furthermore, every workplace must be equipped with first aid supplies. Lastly, every OSHA-covered business must meet specific recordkeeping and posting requirements. For example, the OSHA log of work-related injuries is used to record every significant work-related injury or illness. As mentioned earlier, OSHA covers most businesses with employees. However, based on the industry and the size of the business, some small businesses may be partially exempt from complying with certain OSHA regulations. Partially exempt means that employers are not required to keep OSHA injury and illness records unless they are asked in writing to do so by OSHA, the Bureau of Labor (BLS), or a state agency operating under the authority of OSHA or the BLS. Small businesses that employ ten or fewer employees at all times during the previous calendar year are exempt from routinely keeping injury and illness records. Additionally, a small business in a defined ‘low hazard industry’ is exempt from regular OSHA inspections. Typical small businesses that receive this exemption are retail trade, finance, insurance, real estate, law firms and membership organizations. GLA member artist and art organizations businesses that may be considered partially exempt are described on the schedule attached along with businesses that must keep injury and illness records. For more information on OSHA, please visit www.osha.gov. Sound Recording Industries Sound Recording Industries This industry group comprises establishments primarily engaged in producing and distributing musical recordings, in publishing music, or in providing sound recording and related services. Preforming Arts Companies This industry group comprises establishments primarily in producing live presentations involving the performances of actors and actresses, singer, dancers, musical groups and artist, and other performing artist.